Robert Kelly's interview was interrupted by two young children in the funniest way. Working from home comes with its own set of challenges, especially if you have little children. You run, for example, the risk of children videobombing important interviews, as happened with Professor Robert Kelly. 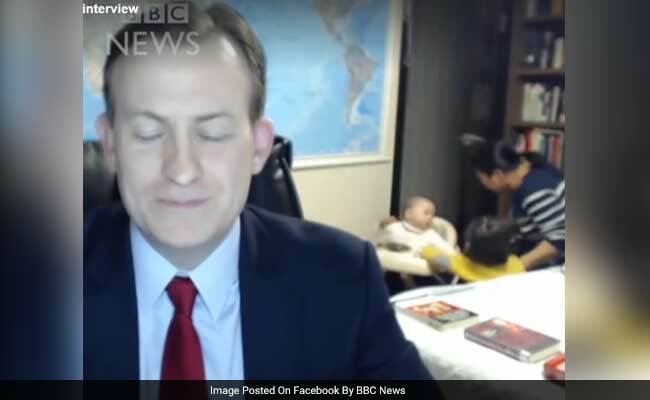 Mr Kelly, an academic based at a South Korean university, was live on BBC World News when in walked in a young girl, dressed in a bright yellow pullover. She was followed by a second youngster, a toddler, only a minute later, as Mr Kelly tried to ignore the chaos going on behind him. To end this broadcast fiasco with perfect comic timing, a woman enters, a loud bang is heard and both the children are swept off as the professor apologises. The hilarious video begins with the professor talking about the South Korean president being forced out of office, when in walks a young girl confidently. "I think one of your children just walked in," chuckles the presenter on the other end of the video broadcast. Mr Kelly can be seen, meanwhile, trying to push the young girl away in obvious embarrassment. There was more to this comedy of errors. An even younger toddler, pulling her or himself on a stroller, walks in in the background. The professor's face at this point is one of utter regret. Since being shared online 11 hours ago, the video has gone massively viral with one version collecting almost 10 million views and over 1 lakh shares on Facebook! "HILARIOUS!!! He is a parent...everybody understands!!! Even the baby in the walker wanted to come see what daddy was doing!!! LOL" says one commenter. Another comments, "I think his children trespassing into the show is the best part of the show. A breath of fresh air."